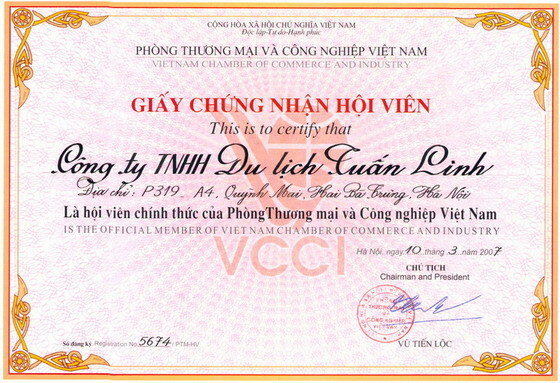 Tuan Linh Travel is very proud of being one of the members of Vietnam Chamber of Commerce and Industry (VCCI). VCCI is a national organization which assembles and represents business community, employers and business associations of all economic sectors in Vietnam. The purpose of VCCI is to protect and assist business enterprises, to contribute to the socio-economic development of the country and to promote economic, commercial and technological co-operations between Vietnam and the rest of the world on the basis of equality and mutual benefit. VCCI is an independent, non-governmental, non-profit organization having the status of a legal entity and operating with financial autonomy.